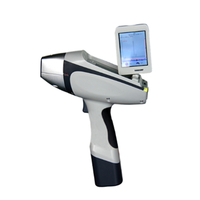 DSHG 7000 XRF Handheld Mineral Analyzer - Buy XRF Handheld Mineral Analyzer, Mineral Analyzer, XRF Mineral Analyzer Product on Dshing Instrument Co.,Ltd. It can test tens of elements.Under common mineral mode,it can detect the elements such as S, K, Ca, Sc, Ti, V, Cr, Mn, Fe, Co, Ni, Cu, Zn, As, Se, Rb, Sr, Zr, Nb, Mo, Ag, Cd, Ln, Sn, Sb, Hf, Ta, Re, W, Au, Hg, Pb, Bi, Cs. And it can detect more elements according to the customers' requirements. Built-in GPS system can record the data into GIS system,which is convenient for geological exploration and mineral in-situ testing.For instance,it helps to search the satellite signals,recording the longitude,latitude,altitude,and satellite number when testing,and save these data accompanied with the test report. .Quickly test a big range of mining rich mineral area in primary. .Test raw ore,concentrate, and tails during the washing process. .Identification of the raw ores and concentrates when purchasing. .Testing of light eleemnts,such as Mg,Ai,Si,P,S,etc. .HD camera helps to visual the testing mineral vein and mineralized points directly.